I have to admit. The world ofÂ “veggie people” food is a pretty unfamiliar study to me.Â ThoughÂ the omni– in my omnivorous eating habit hasn’t had incentiveÂ toÂ explore that direction, it hasn’t affected my respect for the dedication to sustainability and conservation. Enter Veggie Grill – which I was invited to check outÂ and since it’sÂ accessible from myÂ workplace, decided toÂ experience a workday lunch there. I had only heard good things about its expansion into Los Angeles (the first stores are located in Irvine, the third in El Segundo) and when I saw the menu, I could see why. Right off the bat, I noticed nothing on their 100% plant-based menu is priced over $10. For a vegetarian focus, I’m usually hard-pressed to find one menu item that’s under $10. At this price point, it’s worth it to keep an open mind. And well,Â the food is delicious! My Baja Fiesta salad had mangos, roasted corn salsa, carrots and a delicious ginger-papaya dressing that ended up having just the right amount of kick in it. It was also tossed with quinoa for all the quinoa fans out there! So good, and so good for you. I tasted the chili, which tasted so close to the real thing (the look, not so much) and I loved that it was spicy. The corn chowder was so delicious I ended up getting the half-sandwich, full soup combination with the Baja Fiesta. The Papa’s Portobello sandwich was divine. An entire slice of mushroom covered the bottom of the burger and it was then when I discovered that at Veggie Grill, the secret’s in the sauces. They do a great job of keeping things interesting through their all-natural sauces – the garlic pomodoro sauce being the one in this particular sandwich. You’ll also be surprised to find that a lot of the sauces have kick, including atop their kale sides and salads. I haven’t eaten a lot of kale at all, but I really appreciated how fresh these portions were and having been heralded its health benefits before, I’m definitely paying more attention. Their sweet potato fries are a must-have. They’re baked, then flash-fried to finish. A great texture to go along with the fresh taste. And do not discount their desserts. Their carrot cake is not only moist and freshly-made, the frosting is also perfect – you’ll wonder where that cream cheese went. Same with the chocolate pudding, which isn’t exactly rich but you can certainly taste the chocolate in there. While I’ve yet to try, I’m curious as to their “chickin'” and “veggie steak” for my next visit. 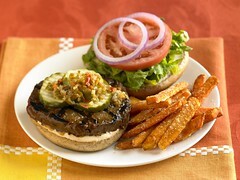 If you’ve tried Veggie Grill – don’t be shy! Leave some thoughts below as to your favorites (and non-) in the comments. I can get used to stopping on even this strip of Sunset Blvd for “healthful grub” such as this. I’m destined for a tasty mean, 100% plant-based or not! 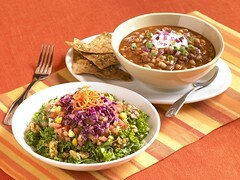 You can also peep the entire Veggie Grill Menu. 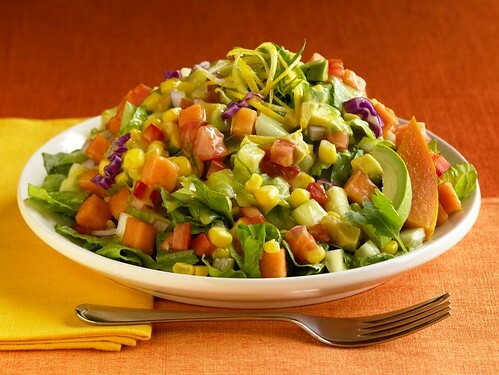 This entry was posted in Deals, Food, Orange County, South Bay, West Hollywood and tagged 100% plant-based, Crescent Heights Blvd, Healthful, Healthy, sunset blvd, Sunset Laemmle Plaza, Vegetarian, Veggie Grill, West Hollywood. Bookmark the permalink.